The INSET statement requests insets that contain the sample mean and standard deviation for each machine in the corresponding tile. The MIDPOINTS= option specifies the midpoints of the histogram bins. 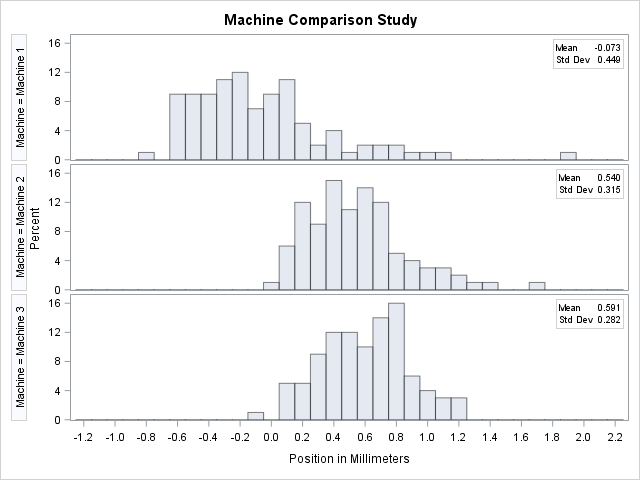 Output 4.17.1 shows that the average position for Machines 2 and 3 are similar and that the spread for Machine 1 is much larger than for Machines 2 and 3. A sample program for this example, uniex11.sas, is available in the SAS Sample Library for Base SAS software.